When talking to Mother about the idea, I explained that there are not many opportunities for hiking in the park and that our proposed trip would focus on the scenic drive and a boat tour from Flamingo on Florida Bay. I suggested that we’d get up early on Sunday, drive down to the park entrance, make our way slowly along the scenic drive stopping at boardwalks and overlooks, and then take an afternoon boat tour before heading home. She called me back a little later to tell me that Dad was game to go, and I started planning in earnest. There are two starting points for boat tours in the park. A Florida Bay tour and a backcountry tour begin at Flamingo, at the end of the main park road. The Ten-Thousand Islands tour and the Turner River tour launch from Everglades City Florida. There is also a tram to an observation tower in Shark Valley. 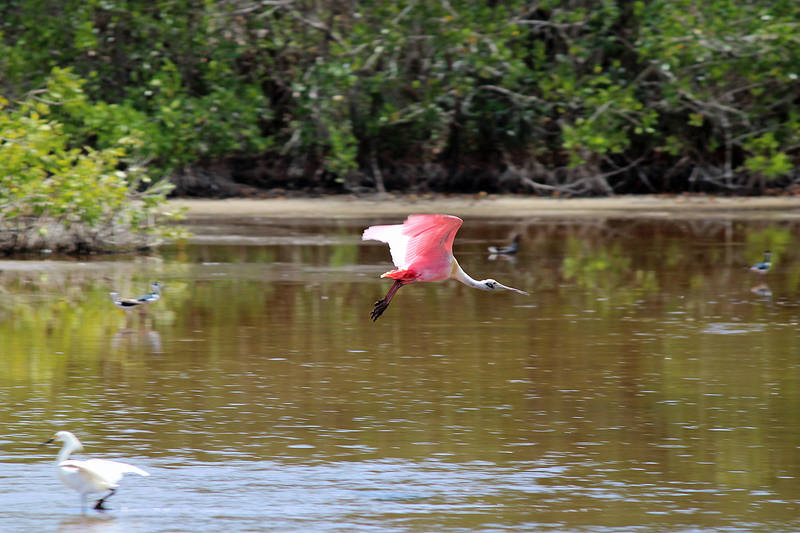 I thought we should focus on Flamingo, and of the tours we should take the backcountry tour because it went north into the mangrove estuaries of the park’s interior. I decided that we could ignore the Shark Valley tram because there was an overlook for Shark Valley Slough (the famous river of grass) on the park road. I began to obsess about the weather forecast and to fret about whether we should make our excursion on Saturday or Sunday. Then early Palm Sunday morning, I got a text from Dad asking me to call him as soon as I could. I was awake and walking to the gym, so I called him right back. They both got on the line and began to explain that it seemed very far for a day trip. My heart sank. But then they proposed that we get a hotel room in Florida City or Homestead so that we would have more time and not have to drive there and back on the same day. Although the final details weren’t worked out until a couple days before we flew to Florida (thanks to the incommunicativeness of the boat tour company), the ultimate plan was that we would depart Saturday morning, April 11 and have a picnic lunch at the Big Cypress National Preserve welcome center not quite three hours later. Then we’d continue on the hotel, check in and drop our things, and continue on to Everglades National Park in time to have a bite to eat at Flamingo before our sunset tour of Florida Bay departed at 6pm. Next day we would have a more leisurely drive of the park road before arriving again at Flamingo for the 11am Backcountry Tour. After that, we’d head back to Lake Ashton.